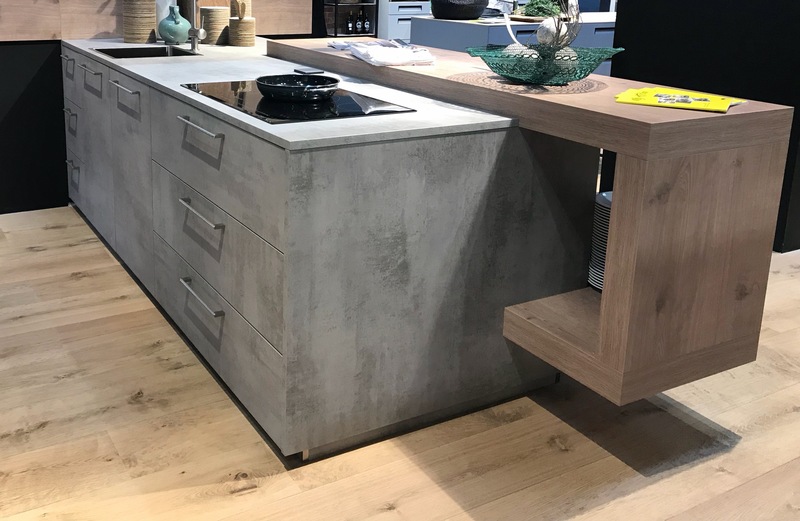 One of the main themes running through a lot of the kitchens that were on show at KBB Birmingham 2018, was the gorgeous concrete trend that we have been seeing more of this year. Personally, I have always loved the industrial, cool concrete look, but it can be a daunting one. 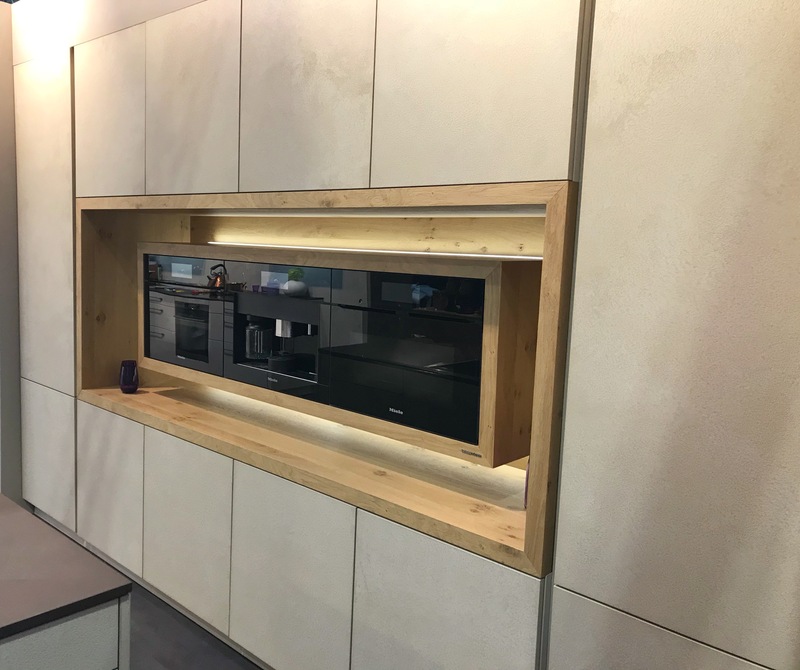 Have a look at this kitchen design by Nolte Kuchen, a large German kitchen brand. This is their realistic Stone range in Concrete, with oak as a feature. The design of this kitchen is so simple, keeping the concrete-style frontal as the star of the show. The warmth of the oak paired with it, really complements the cool feel of the concrete – Man-made next to Nature. Tasteful and balanced. 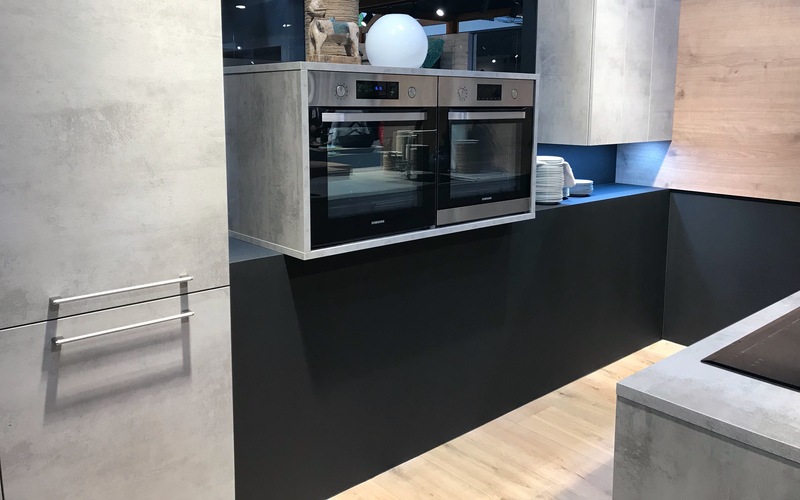 The appliances ‘teetering’ on top of the counter is interesting – it’s a shame the Samsung appliances don’t match up with the stainless steel trim and back glass. That’s something that would immediately attract my attention away from an overall design, but I do really like the fact that the concrete style panels are surrounding them like a frame. You can’t see it in my pictures sadly, but one awesome thing about this particular brand of kitchen is that the units are designed to have the same finish on the inside as on the outside, giving a uniform feel throughout. No ugly white carcasses here! This was a totally different display and I didn’t take this picture so much for the kitchen units…. can we just take a moment to appreciate how amazing this setup looks? These gorgeous Miele appliances are all perfectly lined up and fixed so that they are separated from the rest of the units. They look so sleek and impressive, but more importantly, they look like they are hovering, making them even more of a feature in themselves. The timber surround with the lighting that outlines the three appliances looks incredible, really emphasising the floating effect. It’s so effective – I love it! So, what do you think to the concrete trend? Perhaps you like the idea of bringing a little more of this trend into your space, but the idea of a whole kitchen is just too much? Well, perhaps there is something you can do…. 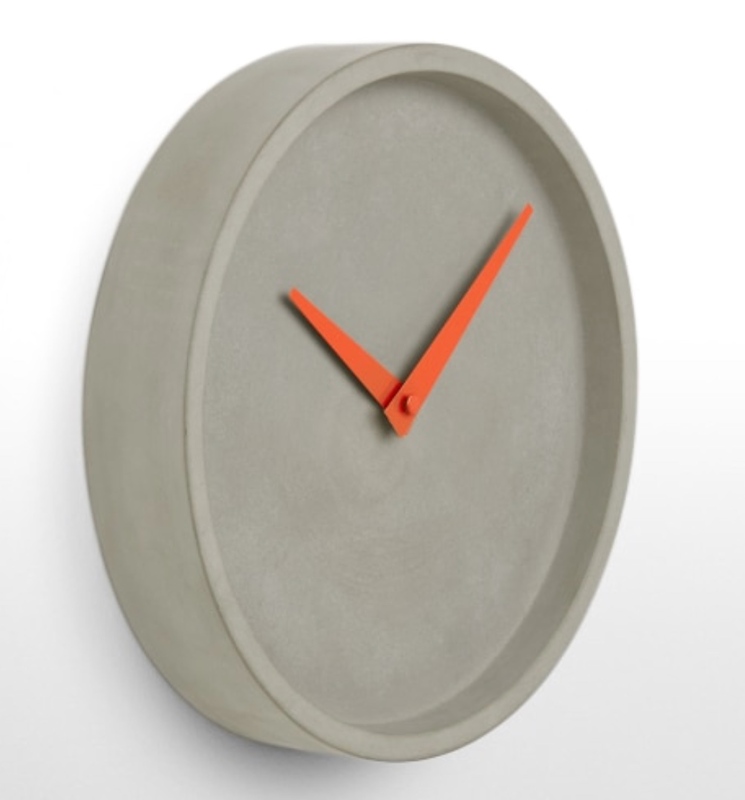 This concrete clock from Made.com would bring a little industrial fun into your space. I love the pop of orange on the minute and second hands! I can totally see this in a kitchen or funky home office. 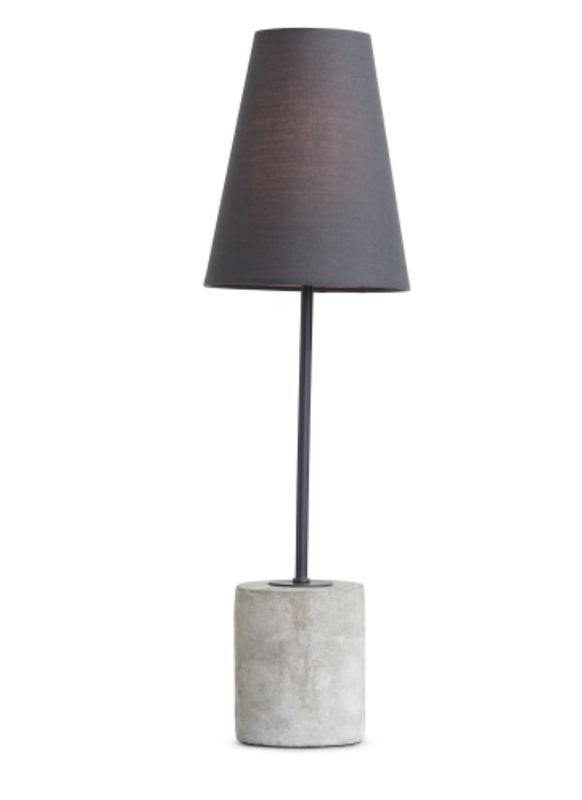 Or, this Ira Table Lamp (also available as a Floor Lamp) on Made.com is also a great way to bring some concrete into your space. I love the texture of the shade on this lamp too and can imagine it looking awesome on a side table next to a reading chair. To add some interest, style with a few extra soft furnishings over the chair, like a textured cushion or a fluffy throw, detracting from the coldness of the concrete. 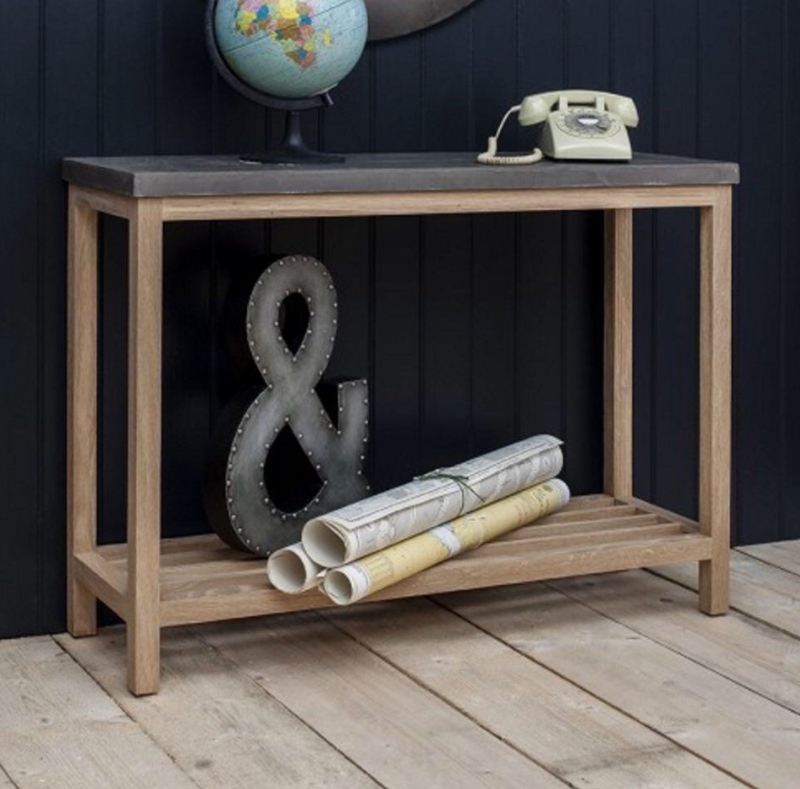 I am more than a little bit in love with this console table by Modish Living, an English company. The solid French Oak mixed with the handcrafted concrete top is GORGEOUS. They do a very cute nest of tables with concrete tops too. I’d love to style this console table with rattan or material baskets on the base for handy storage (everyone needs more storage, right!) and a huge glass vase full of soft green foliage on top. Yes please! So, which one was your favourite out of these few choices? Let me know!